← Thanks for your help . . .
Armageddon Medicine – is this training manual for you? Here’s a thoughtful review from Peter Farmer, who holds advanced degrees in research biology and history, and who is also an RN and EMT. Despite the diversity of products and services offered to “preppers,” a significant gap has existed in the field, namely a resource non-medical people can use to care for themselves and their families in the event of a disaster or other situation where professional medical services may not be available. 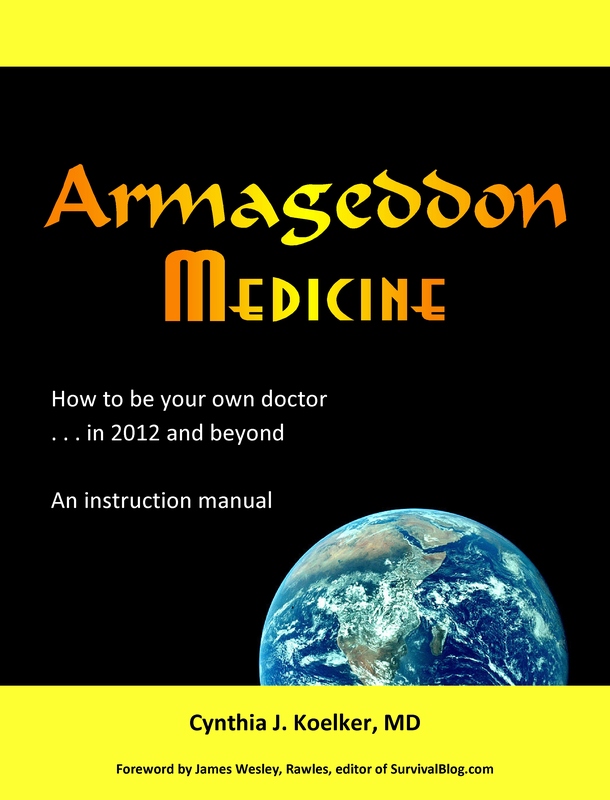 That need has now been met with the release of the new book, Armageddon Medicine, by physician Cynthia Koelker. Her effort deserves a place on the prepper’s bookshelf beside such already-acknowledged classics as Werner and Maxwell’s Where There is No Doctor and similar works. Dr. Koelker, a board-certified family physician of over twenty years’ experience, is eminently qualified to write a manual on medical preparedness. She is a graduate of Case Western Reserve University School of Medicine and M.I.T. She financed her medical education by serving in the National Health Service Corps. She is the founder and head of the Armageddonmedicine.com website, and also serves as chief medical editor for SurvivalBlog.com. She is the author of the book 101 Ways to Save Money on Health Care, (2009), published by Plume Books/Penguin, and has appeared in the media to discuss medical preparedness and related issues. Armageddon Medicine is published in paperback (and hardcover) in the form of an oversized manual, with large-enough print to enable easy reading even for those whose years of best visual acuity are behind them. Yet the book is not so large as to be unwieldy or difficult to use. The book is organized as follows: Dedication, Acknowledgments, Table of Contents, Foreword, Introduction, Preface, Sections One – Ten, Appendices A – C, Index. The dedication is significant; it reads “This book is dedicated to my children and grandchildren, with the hope that they never need to use it.” Dr. Koelker makes this view known implicitly and explicitly throughout her work. The manual is not intended to replace or substitute for care by a trained physician or allied health professional; it is intended for use when these individuals are not available. The approach Dr. Koelker uses in Armageddon Medicine (hereafter abbreviated AM) is somewhat unique. While she does cover how to handle acute care injuries, such as burns, fractures, joint injuries, concussions, and related, Koelker freely admits she is not a trauma specialist. However, she plays to her strength and many years of experience in primary care. The bulk of the book is therefore devoted to chronic ailments and the kinds of complaints seen most by a primary-care physician. It should also be noted that, while the book is targeted towards the lay person, it is also highly useful and easy-to-use for medical professionals. It is refreshingly free of the excessive jargon and extraneous filler often present in professional medical or student texts. It is direct and to-the-point, yet accurate and rigorous. In addition to the “routine” conditions and ailments normally seen by a primary care physician, Koelker has written numerous useful sections on such medically-important subjects as infectious disease, mental illness and psychological disorders (sure to be common in the event of a post-disaster scenario), basic public health and sanitation, quarantine procedures and when to use them, her pain treatment approach, and more. An entire section of the book is devoted to specific conditions, much in the manner that a pathology or medical diagnostics-treatment text – i.e., selected conditions include anemia, asthma/COPD, diabetes, diarrhea, to headache and migraine, hearing loss, to hernias and high blood pressure, to thyroid disease and vision problems, and more. Additional sections of the book include advice on how to assemble a medical kit, and which OTC meds to stockpile, why and how much; she also addresses how to discuss preparedness with your physician or other care provider. Additionally, she covers such timely subjects as the use of expired medications and novel sources of antibiotics in an emergency. Additionally, she recommends which antibiotics and other prescription medications she believes – on the basis of her long experience – are the most important to have on-hand. She also covers selected herbal medicine and other natural remedies. An extremely important part of the book for the untrained (non-medical) person is the section on how to take a health history, and conduct a physical exam. Dr. Koelker has included a section she terms “Special Topics,” which includes discussions of nuclear fallout (due to either accident or detonation of a nuclear device), and bioterrorism. The appendices contain a wealth of useful information, including resources for additional study, as well as lists for putting together your home medical kit, and buying OTC medications. Concerning omissions and other criticisms of the book, there are only a few – and most of these result from the author’s limitations on space and book length, and the inevitable trade-offs that attend to a single-volume reference on such a vast subject. Some omissions may have resulted from legal limits placed on instructing civilians outside of a licensed, accredited healthcare education program. Let’s consider a few of these concerns. The book is not illustrated, and concerning certain conditions or procedures, illustrations would have been helpful. Distinguishing tick or chigger bites from other bites, for example, is more easily learned visually, and not via the written word alone. A picture really is worth a thousand words, some of the time, and both would be even better. Sounds clips, or perhaps a CD/DVD, would have likewise been of great use. A case in point: even trained healthcare people sometimes have trouble picking up certain lung or circulatory sounds. It is perhaps unrealistic to expect a lay person to handle these sometimes subtle cues without reference to an audiovisual guide. The consolation is that if the reader wants to hear lung sounds for a patient with COPD, or what a bruit sounds like, he/she can access those sounds on the internet. It would be useful to provide a template for making a flowchart of the kind nurses and techs use to chart a patient’s vital signs and other data over time. Similarly, a form for data collected for the physical exam would have been nice. Both of these can been found on the internet, however, for those interested in searching for them. The manual is too large and heavy to slip into all but the largest backpacks, and so may not be the reference of choice for lugging on your next trip into the wilderness. However, this is understandable considering the amount of material Dr. Koelker covers in this book. This is simply one of those trade-offs that have to be made when doing a project of this kind. Perhaps the above concerns can be addressed in subsequent volumes or editions of the book, should Dr. Koelker choose to write them. In conclusion, Dr. Koelker has done a wonderful service to the medical preparedness community, as well as members of the general public who may be interested in becoming better informed consumers of healthcare, with Armageddon Medicine, which should find a place on any medical bookshelf. For special offers only for readers of Armageddon Medicine, CLICK HERE. This entry was posted in Abdominal pain, Acetaminophen - Tylenol, Acne, Acne, Acute diseases, Advair, Albuterol-Ventolin-Proventil, Allergic, Allergies, alpha lipoic acid, Anger, Angina, Ankle sprain, Anthrax, Anthrax, Anti-viral meds, Antibacterial topical, Antibiotics, Antidepressants, Anxiety, Anxiety, acute, Armageddon Medicine, Armour thyroid, Arthritis, Aspirin, Asthma, Asthma and COPD, Asthma/COPD, Atrial fibrillation, Bacitracin, Back sprain, Benadryl - diphenhydramine, Bioterrorism, Bites-animal, Bites-insect-bug-tick, Blood pressure meds, Blood tests, Bloody urine, Bonine - meclizine, Books, Bookshelf, Broken bones-see fractures, Bronchitis, Caffeine, Celebrex, Chest pain, Chicken pox, Chlamydia, Chlorhexidine oral rinse, chlorpheniramine, Cholera, Chronic bronchitis, Chronic diseases, Claritin - loratadine, Colloidal silver, Common cold, Congestive heart failure, Constipation, Constipation, Constipation, COPD, COPD see Asthma, Cough, Death and dying, Dehydration, Delivery, Depression, Depression, Diabetes Mellitus Type I, Diabetes Mellitus Type II, Diarrhea, Diarrhea, Diclofenac, Difficulty urinating, Disaster Relief, Diseases, Dizziness, Dramamine - meclizine, Dry skin, Ear infection, Earache, Education, Emphysema, Equipment, Exercise-induced, Expired medications, Expired meds, Eye infection, Fatigue, Fever, Field equipment, Fish antibiotics, Flank pain, Fractures, Frequent urination, Gallstones, GERD / Acid reflux, GI-gastrointestinal, Gonorrhea, Grief, Head lice, Heart disease, Heartburn/stomach acid, Herbal and complementary, Herbal medicine, Herpes, High blood pressure, Home birth, HPV, Humira, Hydrogen peroxide, Hyperthyroidism, Hypothyroidism, Ibuprofen, Ibuprofen, Immunization, Influenza, Injuries, Insect-bug-tick bites, Insulin, Kidney stone, Lacerations, Laryngitis, levothyroxine, Lice, Lice treatments, Lidocaine, Lung disease, Lyme disease, Meclizine, Medical archives, Medical Kit, Medical Supplies - see Supplies, Medical testing, Medications, Mental health, Microscope, Microscopic examination, Migraine, Naproxen, Naproxen (Aleve), Nausea, Newborn care, NSAIDs, Nuclear radiation exposure, Nutrition, Omega-3 fatty acid, OTC Antihistamines, OTC Decongestants, OTC inhalers, OTC Nausea/vomiting meds, OTC NSAIDs, OTC Pain meds, Over-the-counter meds, Pain, Peak flow meter, Pink eye, Pleurisy, Pneumonia, Potassium Iodide KI, Power supply, Power supply, Pregnancy, Preparation, Prescription Medications, Primatene, Primatene mist, Public health, Rabies, Radiation - nuclear, Rapid heart rate, Rash, Rheumatoid arthritis, Self-defense, Shelf life, Shortness of breath, Singulair, Skin, Skin infection, Slide show, Smallpox, Sore mouth or gums, Sore throat, Spiritual health, Sprains, STD, Stockpiling medical supplies, Stockpiling medications, Stomach flu, Stomach problems, Strep throat, Stress, Sudafed-PE - phenylephrine, Sudafed-pseudoephedrine, Supplies - Medical, Swelling, Syphilis, Syphilis, T3 and T4, Tamiflu, Teeth, Thrush, Thyroid, Thyroid cancer, Thyroid disease, Thyroid preparations, Thyroid tests, Tick-borne illness, Toothache, Toothache, Triple antibiotic ointment, TSH, Ulcer, Urinary tract infection, Vaccination, Veterinary, Vicks, Vomiting, Vomiting, Waste disposal, Water, Weight gain, Weight loss, Wheeze, Wound care, Wrist sprain, Yeast infection, Zyrtec - cetirizine and tagged Case Western Reserve University School of Medicine, Hurricane Katrina, James Wesley Rawles, Koelker, Medicine, Mel Tappan, National Health Service Corps, Physician. Bookmark the permalink. Hi Dr. Koelker, I was on the Surviavl Blog site and saw where Mr. Rawles had a great write up on you. I just ordered your book. I am truly looking forward to getting it.